I was often known as ‘The Hippie’ – to friends, work colleagues, family and relatives. It therefore bears no surprise that I now find myself living on a small but spacious parcel of land in the deep South of our Sunburnt Country – homeschooling, tending food gardens, collecting eggs from our chickens, living as organically as possible, preserving our own food, cooking from scratch and dabbling in all sorts of crafts – particularly fibre based mediums. This space doesn’t set out to be focussed on any particular topic. I’ve previously written a family journal blog and a food based blog – but the expectation of keeping up a regular blog telling a daily story is too much for my current rhythm. So whilst this space doesn’t set out to solely write about homeschooling, organic living, whole foods, Waldorf parenting, natural crafts or the beauty of wild spaces – these are all topics, amongst others similar to this, that you’ll see discussed here on Another Day. Just like our life here in Tassie, this blog has the intention to be calm and easy – a post here or there and sometimes lots in between. You may hear from me all in a flurry and then not for a while. 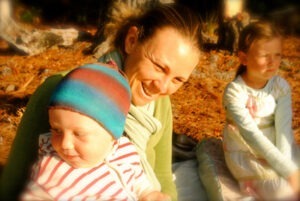 Raising healthy, happy children and holding the space of a harmonious home is my primary focus. Bringing some of our stories here will be something I sit and quietly do on those evenings when the laundry is folded, the breakfast is organised and two little wee one’s are tucked up tightly in bed sweetly dreaming of tomorrow’s adventures or today’s great memories. But to be honest, sometimes I’m sure I’ll also feel inspired to share pictures and words here, when the clean washing is bundled in a heap on the bedroom floor, there’s something fermenting somewhere on a corner of our kitchen bench that needs tending to and a tiny little bubba is curled up dozing on my lap between sips of Mumma’s milk. Welcome to our little online space, I hope you enjoy the stories and pictures shared. As I write here on Another Day, you’ll get to know that ‘short and sweet’ is not my forte. I’m inspired by those who can write with exactness and eloquence. You’ll get to know that I ramble – so please when you come here, have a warm cup of chai to sit and sip while we chat in this space and I’ll do my best to get to the point, as I know you’ve probably other friends to stop in on and visit as well. I appreciate you stopping by our little virtual place here at Another Day.